UP FOR SALE IS A BRAND NEW COLONY RAINBOW BRETHREN BRAKE! WORKS FOR FRONT OR REAR BRAKE..
UP FOR SALE IS A BRAND NEW ODYSSEY EVO BRAKE KIT! 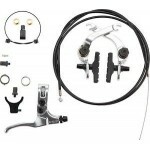 EVERYTHING..
UP FOR SALE IS A BRAND NEW ODYSSEY G3 GYRO CABLE LOWER IN BLACK! Odyssey..
UP FOR SALE IS A BRAND NEW ODYSSEY MONOLEVER MEDIUM BLACK ..
UP FOR SALE IS A BRAND NEW ODYSSEY MONOLEVER MEDIUM POLISHED..
UP FOR SALE IS A BRAND NEW SALT PLUS ECHO REAR BRAKE IN OIL SLICK! &nbs..
UP FOR SALE IS A BRAND NEW SNAFU ANCHOR BRAKE LEVER! RIGHT S..